I was looking at the last post I made here and it was for a baby hat and sweater for T. That baby is 19 months old now! And so much has happened since that little sweater. His 2 H-girl aunts gave him uncles. Yes, 2 weddings: the first in May and the last in August. Needless to say, last summer was a blur. Not only did 2 daughters get married, but 2 daughters moved about 800 miles away from me. IN OPPOSITE DIRECTIONS! And one of them took my baby T with her. We did all get together for Christmas in South Carolina, including Sr. Mrs. H. That was fun. My friend and Co-Worker, ChurchSec, has provided my most recent projects. She was looking for baby shower gifts that were Star Wars themed and wanted to know if I could help. I smiled. 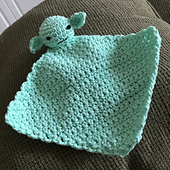 I've made several of the projects and thought I'd modify one to make a lovey for the expected new Star Wars fan. 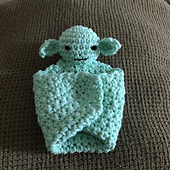 This is what I came up with: the Yoda lovey. He's made of cotton so he's completely washable. He's hand sized, so he doesn't take up much room. The perfect companion. 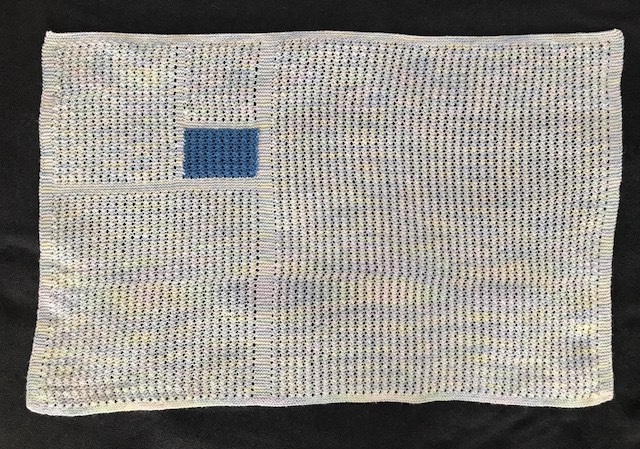 I wanted to make something else so I looked for an R2D2 graph that I could work into a washcloth. I tried to copy a finished photo, but the poor thing looked way more like Robby the Robot from Forbidden Planet than our favorite droid. I'll keep Robby to wash my dishes. I ended up graphing my own version of R2. I've always loved graph paper! Now I have a real use for it. A word of warning if you are wanting to graph for knitting: If you want your actual knitting to be proportioned like your graph, don't use square graph paper. You can download knit appropriate graph paper or make your own using Excel or google sheets. The columns need to be slightly wider than the rows are tall. If you just want to try it out with school graph paper, be aware that your knitting will be slightly wider than what the graph shows. But we've got a grandson on the way, and another baby shower, this time at our home church, where our eldest grew up. I've been working on a matching sweater and hat. I found a likely candidate pattern here, but there were issues I didn't quite understand. 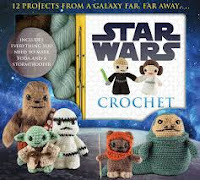 I've rewritten it without the bound off tabs and illustrated how to align the pieces on one long circular needle. You can download a link with the PDF here. Back in January, Mr. H and I went down to his Mom's house to meet up with our eldest and and her husband for dinner. It was their first free weekend in a while. Our FSIL (FavoriteSonInLaw)'s sister's wedding was New Year's Eve and, December being what it is every year, they were ready for a no stress outing. And they had been keeping a secret! As we sat in Sr. Mrs. H's den, our eldest got up, handed me this ball of yarn, and said with a smile, "Now you can start knitting baby things." I had already been toying with the idea of designing a lace pattern to make a scarf, but hadn't made much progress. Now I had a purpose! The basic lace pattern came about over the next week. I think of it as 0, 1, 2 for one row, followed by 1, 2, 0. The 0 is a yarn over, 1 is knit 1, and 2 is knit 2 together. Then a blanket design began to materialize in my head. The Golden Ratio has always intrigued me, so I started with that in mind. I was so eager to get started that I didn't really plan well. I cast on my stitches and started a bottom border before the final design had come together. My finished blanket is a bit different than the written pattern that is attached below. The center border is wider than it should be and the top and bottom borders aren't wide enough. I had just gotten to the top border of the lower left square when we discovered that the baby is a boy. I thought that deserved celebrating for Mr. H's sake! I had some blue left from a project a few years back that would co-ordinate nicely with the mostly white blanket. In the process, I discovered that I am not adept at intarsia knitting! My project was no longer portable and the 3 balls of twisting yarn gave me a headache! Luckily, the blue box is relatively small, and I was back to a single ball pretty quickly. The instructions don't include any color changes. I didn't feel confident enough to guide someone else through that. Now that the blanket is finished, I thought I'd spend a little time writing it out. If you'd like the PDF, click here. If you find any errors, or need clarification, please let me know. I'll fix or explain anything I can. This morning as I was sitting out on the deck (in my recently re-located swinging hammock chair), I heard a commotion going on behind me. The usual early morning commotion is caused by hummingbirds and their refusal to share a feeder. (Are hummingbird-feeder manufacturers aware of this trait? And if so, why do they insist on putting 3 or 4 feeding flowers on a device that will in fact only be utilized by one hummer at at time?) This morning's commotion, however, was not hummingbirds but blue birds. We have a nesting box in our yard that has been occupied every summer for 18 years. It came about as the result of a blue bird nest continually being constructed in our drier vent. At the time, we lived in a mobile home on the property. The vent for the drier ran under the house and ended at the exterior wall. I was afraid the heat would fry the baby birds that would eventually abide there, not to mention being a fire hazard. I removed several nest start-ups, but those birds were determined to build there. I finally settled on a substitution plan. El was a newborn and I noticed that formula cans were roughly the same diameter as the drier vent. I covered the vent with mesh and attached an empty formula can directly under the opening. The blue birds liked it just as well and proceeded to build anew. The girls were able to watch several broods of baby blue birds that summer. Early the next spring, we bought a blue bird nesting box and mounted it on a post in the yard. It's been inhabited every year since then. Back to this morning: The commotion was lots of agitated twittering at the box. I spun my chair around to see what was happening. The dark blue dad was on a nearby antennae guy wire. The less-blue mom was on the front of the box. It looked like she was blocking the entrance. An even lesser-blue fledgling was on top of the box. And all of them were making blue bird noises, all at the same time. I imagine it was the blue bird equivalent to a T-ball game: lots of encouraging yells from the parents and lots of excitement and/or whining from the kid being forced out of his comfort zone. By the time I had to leave, he had flown over to the big oak tree. He was sitting on the end of a branch with his mom nearby. And the commotion had ceased. Have you ever wondered what triggers dreams? THE HULL HALL SONIC EGG OF DESTRUCTION! I think the dream was a result of the game we played after supper last night. It's called Munchkins. In order to play we had to watch several youtube videos because, while entertaining, the instructions were not very helpful at first. After playing the game twice (both games won by the 21 year old version of the above redhead), the instructions did make a few things clearer. There are dwarves and elves and warriors and thieves. There are monsters and curses and treasure. And the names are just plain silly: Squidzilla and the Gelatinous Octahedron are 2 of the monsters. The Cheese Grater of Peace and the Potion of Idiotic Bravery are names of weapons. I'm guessing the Hull Hall Sonic Egg of Destruction will be in a later edition. Our youngest daughter graduated high school in May of this year, but never had time in her schedule for a senior trip. We decided that Christmas vacation from college would be the perfect time to go. After much debate (and a final word from Mr. H), Washington D.C. was named as the destination. Mr. H and I had been there back before we had any children, but that was about 30 years ago. Some things haven't changed at all, others have changed significantly! The discussion happening here is not as heated as it appears. Mr. H and the 2 youngest H girls. The girls are almost recreating a picture taken by my brother about 30 years ago. I think this is one of the coolest monuments I've ever seen. We approached it from the street, which is the back side. You can't see the face of the center section until you walk between the 2 rear pieces and past the cut out piece. She's posing with that other Eleanor. This is where we got lunch that first day. The street was lined with food trucks serving just about every kind of food imaginable. We had some time to spare before we had to be somewhere that evening. A Starbucks with some outside tables was the perfect spot to sit and watch. D.C. is just about as different from home as can be imagined! All those lights and all those people! We had tickets for the Kennedy Center to see "Matilda the Musical" that night. Before it started we went to a free concert called "Merry TubaChristmas" on the Millennium Stage of the Concert Hall. I have never seen this many tubas and euphoniums (or should that be euphonia?) all in one place. The stage as well as the box and 1st and 2nd tier levels on both sides were full of musicians of all ages and skill levels. They played carols arranged specifically for this instrumentation. It was great fun. The following day, which was wet and much colder, we spent indoors as much as possible. We took a tour of the Capital, which is currently being renovated. Here's Mr. H standing by the statue from his state of birth. There are 2 statues from each state in various places throughout the Capital. 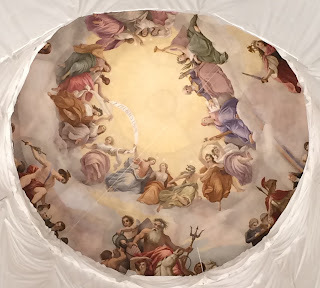 You can see the plastic surrounding the Apotheosis of Washington at the eye of the Rotunda. Floor level of the Rotunda was filled with scaffolding, so it was difficult to see it. The next 2 pictures are of the Library of Congress. I believe this has got to be one of the most beautiful buildings I have ever been inside. We did miles of walking while we were in the city. 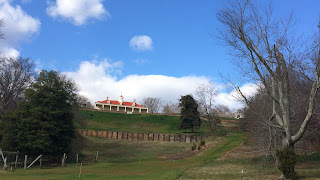 We did WAY more driving to get to and from D.C. I've been knitting for a few years now. and finally got up the courage to try socks. I figure now it's time to try my hand at a sweater. I found a free Ravelry pattern called Purple Sweater by Jennifer Stark. She calls for a bulkier yarn than I wanted to use, so I'm making some adjustments. I'm using a worsted weight yarn so it will take more stitches per inch. I'm thinking if I knit a larger size with the smaller yarn, I'm going to be close. 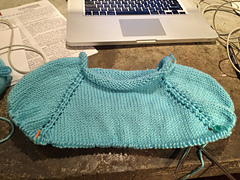 So I am knitting using the XL pattern numbers and I'll see how close it comes to the medium that I wear. I started it while we were on our vacation. (Driving to Washington, D.C. gives the passengers PLENTY of time to keep their hands occupied!) I've completed about 40 rows so far.